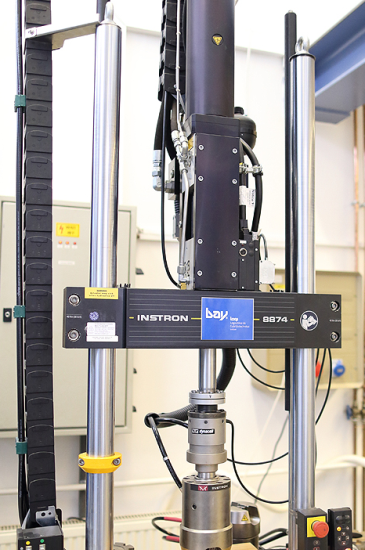 The equipment can carry out static and fatigue tests, with complete PC control. The equipment has two actuators (an axial and a torsional), that can be controlled together and independently also. The actuator is in the upper crosshead. The T-slot table at the bottom of the equipment allows you to test even larger structures, components. The following quantities can be measured during testing: force, torque, displacement, rotation, axial and torsial strain, and transversal strain deformation. 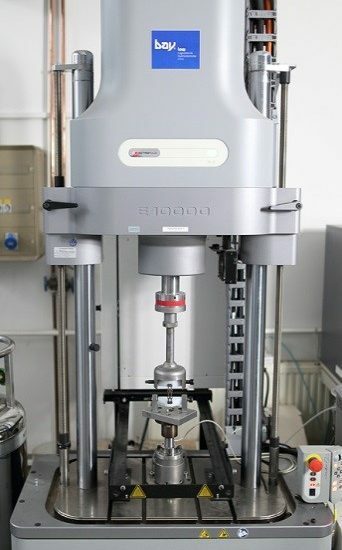 Universal servohydraulic fatigue testing system, which performs static and dynamic tests on materials and its components. Its console software provides full system control from PC. The actuator is at lower table base. The equipment can measure the following quantities: force, displacement, axial and transversal strain deformation. The available temperature depends on the temperature tolerance of the clamp and the extensometer, that is used in the test. In our climate chamber and high temperature furnace we can carry out tests between -150 and +1400 °C temperature. 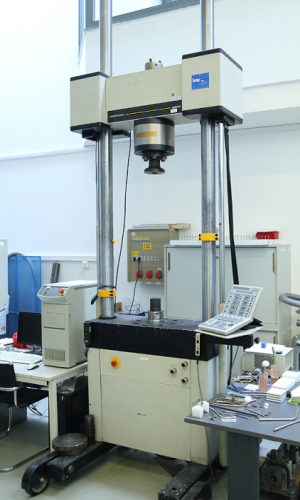 The equipment can carry out static and fatigue tests. Its controll software provides full system control form a PC. The equipment has two actuators (an axial and a torsion), that can be controlled together and independently also. The actuator is in the upper crosshead. The T-slot table in the bottom of the equipment allows you to test even larger structures, components. 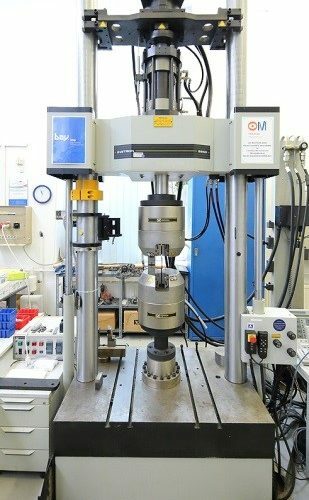 The equipment can measure the following quantities: force, torque, displacement, rotation, axial and torsial strain, and transversal strain deformation. In the case of fatigue tests, the available maximum frequency is approximately 30 Hz in the axial direction, and approx. 10 Hz by rotation. The actual maximum frequency depends on the amount of the displacements or rotations. The equipment can carry out static and fatigue tests, and its control software provides full system control from a PC. The equipment has two actuators (an axial and a torsion), that can be controlled together and independently also. The T-slot table in the bottom of the equipment allows to test even larger structures. The equipment can measure the following quantities: force, torque, displacement, rotation, axial and torsial strain, and transversal strain deformation. In the case of fatigue tests, the available maximum frequency is approximately 100 Hz in the axial direction, and approx. 30 Hz by rotation. The actual maximum frequency depends on the amount of displacements or rotations. All the tests can be controlled and evaluated by the software. The measured values (time, force, torque, displacement, rotation, strain) ​​can be stored, so we can use them for further evaluations.